If you are thinking of starting a blog, today is the best day to do it. You can start your money-making blog for just $2.95/month (remember this price is only through my link and for a limited time!) when you sign up for a 12-month basic plan and you get a FREE domain. Update: From this month on, I will be sharing my blog updates from the 1st to the end of the month instead of 23rd (which is the date my blog was live). The below update includes the last week of July. Last month’s page views were bit low as it’s still the summer slump. The thing that I am super excited about is, my bounce rate is going down. My returning visitors are also on the rise, which means that my post engagement is going up. Finishing my first year of blogging with so much support and feedback has given me a great boost to give more useful content. Though I focused on list building late in my blogging journey, it has grown very fast. My FREE blogging course is doing very well, and it makes my day when I get emails from my readers about how the course is helping them. I have poured everything that I have learned in this course and the feedback I am getting is simply awesome. Right now my subscribers are at 2,500, and I am hoping to grow it at a faster rate from this month on with more useful freebies. If you are new to blogging, then I would suggest you focus on Pinterest more than other platforms. Pinterest has been my major traffic source, and I give most of the credit to the manual pinning with Pinteresting Strategies. My Pinterest followers are over 8k now but what I have understood is, you don’t need to have a huge following to get massive traffic, it is more about the right pinning strategies. The followers will grow eventually. My Facebook growth has been steady, and apart from focusing on Pinterest, I spend a large amount of my time on this social media. I am part of many Facebook groups, and if you are starting out with a new blog, then I highly recommend to join groups to kick start your page views. If you are looking for a good guide or resource to get started on this platform, then you need Brittany Ann’s Strategies Worth Sharing. I cannot say enough of this eBook. As I mentioned in my last blog update, this year I plan to focus on Twitter. Though right now this platform does not drive much traffic to my blog, I believe I need to work on it to see a change. The growth through this social media channel is something I am very proud of. I worked very hard to grow on Instagram as you know I love photography. I have crossed 1k followers on this channel now, and I am planning to grow more this month. 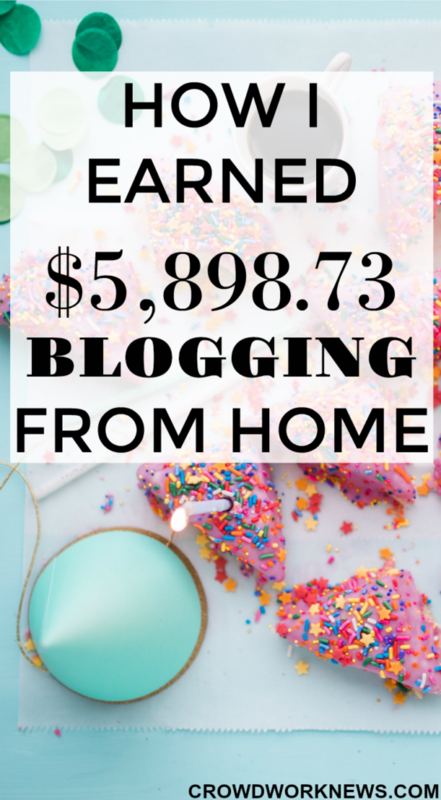 Now for the income report, last month my income was $5,898.73 (inclusive of last week of July) and most of it was from affiliate marketing and display advertising. The revenue numbers are looking good in spite of the traffic slump. And one thing I worked on was to diversify the income sources, and it is working. Last month, my income was generated from many sources, and I will keep working on expanding it more. The most frequent emails I get from my readers who have started blogging is how to start making money. Well, when I started I was clueless, and one resource that helped me immensely to start making money with my blog was Making Sense of Affiliate Marketing course. This course is an all inclusive course about affiliate marketing, apart from this, the bonuses that you get with this course are also the big part of my affiliate income success. I have been tweaking my blog layout a bit to optimize it for ad earnings. As you know, I have changed to AdThrive, and I am very pleased with their support. I am getting ready to write content ahead for the coming months so that I can focus more on building my list and promoting better. I am constantly updating new pins for some blog posts. I highly recommend doing this if you want more views on Pinterest for your old blog posts. But the biggest impact I have seen was for the bonuses that I offered in my FREE blogging course. I am planning to add more useful bonuses for this course. I want to help you succeed in your blogging journey. I am a life long learner. And blogging is perfect for someone like me. When it comes to blogging, you get to learn so many things each and every day. With the success of my free blogging course, I have understood that many work-at-home enthusiasts want to start blogging and I intend to create more content for them. As the summer slump comes to an end this month, I will be focusing promoting more on different social media and also work on SEO. This year my primary focus would be to get more traffic and reduce the bounce rate further. I am hoping to see the page views crossing 150k this month. Very hopeful of reaching this target! As I always say instead of having target for income, I love to see some income progression. The ultimate goal this year would be to break the five figures. Wish me luck! I already have some ideas for creating freebies for my readers. I will work towards to growing my subscribers to over 3,000 this month.